I used to be afraid that I would die young like my Mother now I'm afraid that I will live to be old like my Father. My Mother died of Ovarian Cancer when she was just a little older than I am now. I am very fortunate, due to the Familial Cancer Clinic at The Princess Margaret Hospital here in Toronto my younger sister and I had the genetic testing and we now both know that neither of us carry the gene. I was in my early 20's when we lost my Mother and even to this day typing these words brings tears to my eyes. My Father is now 83 and has been diagnosed with Mixed Dementia. That means he has both Alzheimer's and Vascular Dementia. It's a very sad disease to watch. There is a slow loss of his personality and he is often fearful as the world seems to spin around him in a way he can no longer comprehend. A nurse at the facility he is living at suggested that I go to some of the events that the Alzheimer's Society runs. I highly recommend that anyone in the same situation contact them at http://www.alzheimertoronto.org/They provide an outstanding level of support and practical advice as well as contact with many other families going through this difficult transition of relationships. I never get bored as long as I have my knitting I'm happy. Waiting for appointments is never an problem for me for the same reason. I think knitting has engaged me for so long because there is always something new (old) to learn. I've taken many courses over the years with the fabulous teachers out there. 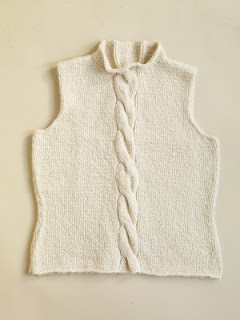 Sally Melville http://www.sallymelvilleknits.com/, Debbie New, Maureen Mason-Jamieson http://www.kinverknits.com/links.htmand Annie Modesitt http://www.anniemodesitt.com/ to name just a few. 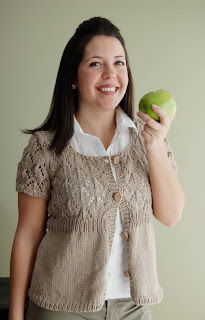 This is the pinwheel cardigan. It started as a hat pattern knit in white linen when Karen of Village Yarns http://villageyarns.blogspot.com/ asked me to design a summer hat for the store. I ended up with two different styles both started from the center top. I just love that kind of knitting...cast on and go. So next I cast on some Fleece artist angel hair and kept knitting until I ran out of yarn. You can see that version on Ravelry http://www.ravelry.com/people/knittingrobin as my avatar. 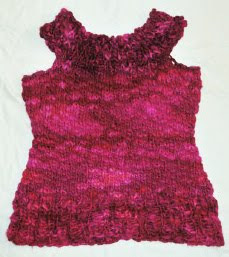 When I wrote the first version of the pattern as a gauge less design my tech editor worried that I would alienate the pattern dependant so I had a sample knit and we wrote the pattern two ways. One for this great yarn http:///www.kertzer.com/Default.aspx?tabid=68 and the second so that any yarn (from lace weight to chunky) can be used. Julia over at Patternfish http://www.patternfish.com/ posted it and then suggested a minor name change and we sold a copy faster than I can update and e mail a PDF. I spent time during the month of July thinking a lot about the fact that I don't normally get bored. I'm an avid reader and I knit every day. I do get bored at work mainly because I want to move forward with my new career ASAP. I have a very definite timeline and good financial reasons for staying in my job. I have dealt with the boredom in the office in a number of ways. I focus on doing every item in the best and most efficient way that I can. I invent projects for myself that no one has asked me to do yet bring value to the firm and to my role there. I go for a walk at lunch every day to re energize my self. I use dead time at the end of the day to read entrepreneurial and self development blogs. I'm amazed by the blogging community out there and the access they give me to people I would never normally get to meet but who now share their wisdom with me.